The 4 brands of instant refried beans we taste tested. We bought 4 of the best instant refried bean brands available and recruited 4 taste testers to blindly taste and score each of them. Santa Fe Instant Southwestern Style Refried Beans earned the highest average score with a 3 out of 5 stars for taste. If you want the tastiest brand it’s the one we recommend. The other 3 brands weren’t far behind. They all tied for second with an average of 2.75 out of 5 stars. None were particularly terrible or exceptional. Despite every brand containing the exact same ingredients — pinto beans, soybean oil, and salt — the flavor and texture varied a fair bit from brand to brand. Read on for our full reviews and our tasters’ comments on each. Overall tasters liked the taste and consistency of the Santa Fe beans. Santa Fe averaged 3 out of 5 stars for taste, the highest of any brand by a slim margin. The Santa Fe beans were just as easy to prep as any of the other brands. You simply bring the recommended amount of water to a boil, stir in the contents of the package, cover, and let it simmer for 5 minutes while stirring occasionally. From hanging out on hiker forums and online communities this appears to be the most popular brand among campers and backpackers. It seems were not the only ones who think it’s the tastiest. Note: Santa Fe makes other varieties such as Instant Fat Free, Vegetarian Refried Beans and Instant Fat Free, Black Refried Beans. The Cookquik beans were described by multiple tasters as having a smoky flavor. “Slightly smoky flavor,” wrote one. “Mild smoky taste,” wrote another. They averaged 2.75 out of 5 stars for taste, with all but one taster giving them 3 stars. Overall the sentiment among tasters was that they were decent. The Cookquik beans come in a giant package containing 30 oz of instant beans. Campers and backpackers who want a package they can open and eat in one sitting should look elsewhere. Unlike the other 3 brands, Herdez adds citric acid to their soybean oil to preserve flavor. Apparently, this was enough to change the flavor slightly because multiple tasters thought the Herdez beans had a unique taste. I tasted all the brands myself and this was my personal favorite. But other tasters ranked it in the middle of the pack. It averaged 2.75 out of 5 stars for taste. Tasters liked the consistency and noted the “smooth and pleasant texture.” The dehydrated bean chips in some of the other brands didn’t fully rehydrate which led to them having varying texture from bite to bite. Not so with the Herdez beans. One small nod in favor of these beans is that they call for the least amount of water of the bunch, just 1.5 cups. 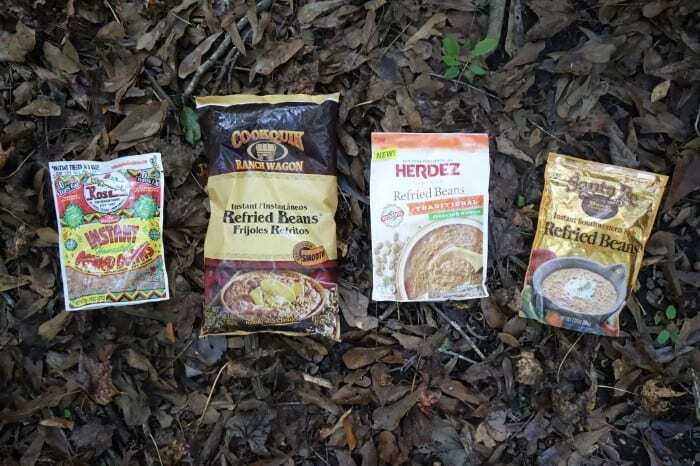 If you’re going on a backcountry trip where water (or backpacking stove fuel) will be in short supply, these might be the right instant beans for you. The Mexicali Rose beans called for the most water of any brand, 2.5 cups. Accordingly, they were quite soupy. If we were to remake them we’d probably add just 2 cups of water. Three tasters gave these beans 2 out of 5 stars, while one liked them so much he gave them a 5 out of 5 — the only perfect rating in the taste test. “Soupy, mild and pleasant bean flavor,” he wrote. He also noted that it would pair well with rice or some other side that could absorb some of the extra water. When we averaged the scores the Mexicali beans tied for second with the Herdez and Cookquik beans. We decided to taste test instant refried beans because they’re a popular camping and backpacking food. They’re tasty, filling, high in fiber, calorically dense, and can be paired well with a number of other common trail foods. If you want to cook them according to package instructions, it helps to have a backpacking stove with an adjustable flame or a simmer ring. That way you can easily simmer the beans on low for 5 minutes like each brand instructs. If you want to cold soak them, pack a cold-soaking container such as a Talenti gelato jar. Start soaking them in water at least 30 minutes before you eat. That gives them enough time to rehydrate so you don’t end up having to eat cold and crunchy instant refried beans. I used a Talenti jar to cold soak instant refried beans on a recent trip to the Grand Staircase-Escalante National Monument in Utah. We prepared each brand according to the instructions on the package. First, I prepped each brand of beans according to the instructions on the package. Tasters knew each brand only by letter. A: Santa Fe, B: Mexicali Rose, C: Herdez, D: Cookquik. Then I had 4 taste testers blindly taste each brand and score them from 1 to 5 for taste. They also wrote down any comments they had. After each taster was done I averaged the scores for each brand. These averages are the scores found in the comparison table at the top of the page.